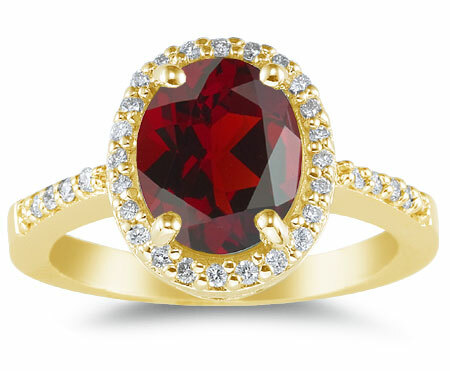 This lovely, deep red garnet is beautiful when paired with a halo of diamonds and a 14K yellow gold band in Apples of Gold Jewelry's red garnet and diamond cocktail ring. Perfect for parties, entertaining, or simply a night on the town with your loved one, this ring features an authentic AA rated garnet, 10mm x 8mm in size, surrounded by 34 diamonds, which are of H-I quality for color and SI quality for quality. The diamonds, which lend 0.34 carats to the gemstone ring, are also on the band itself, creating a fun and unique design. We guarantee our Red Garnet and Diamond Cocktail Ring in 14K Yellow Gold to be high quality, authentic jewelry, as described above.